Playa Graciosa - 2 Bed, 2 Bath, Two Terraces! 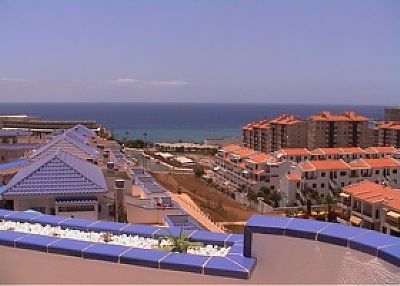 Lovely two bedroom apartment in Playa Graciosa, Los Cristianos with two large sunny terraces and spectacular views. 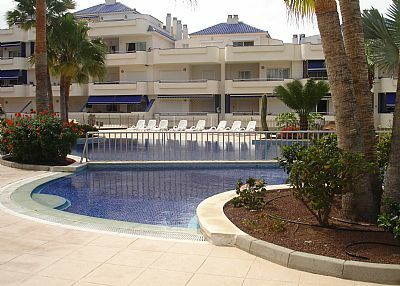 Only a stones throw from the sea situated on a complex with two large pools. Set within the more exclusive end of Los Cristianos this gorgeous apartment to rent offers the perfect combination of peace and tranquility yet is only 5 minutes walk from the beach. Playa Graciosa is an immaculately maintained complex with two pools - one heated in winter - and plenty of free sun beds. Like the complex, the apartment is sparkling and fresh. It is a true home from home and furnished like it. A huge feature of the apartment is that through its two terrace (front and back) you keep the sun all day long. You will spend a majority of the day on the main front balcony, overlooking the pool, which is particularly large and has plenty of room to stretch out. As the sun moves across simply move to the back terrace and watch it go down over the sea! The living room is particularly well furnished and comfortable with leather sofas and satellite TV (BBC1, 2, ITV and CH4). The kitchen is very well equipped. There is a utility area with washing machine. 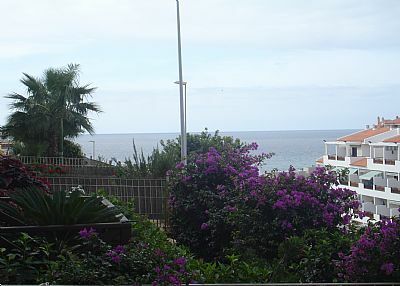 The front balcony overlooks the sea and consists of a table, 6 chairs and sun loungers. The back terrace has a tabe and 4 chairs. Here is a perfect place for an early evening drink whilst watching the sun set over the harbour! The well designed pool area acts as a real suntrap and is therefore ideal for sun worshippers. The complex is extremely well situated for all local amenities. This beach with its shops, bars and restaurants are only a 5 minute walk away. Full Size Oven & Hob, Microwave, Fridge / Freezer compartment, Electric Kettle, Toaster. Doors to back terrace. Two Large Sofas, coffee table, satellite TV (BBC1, 2, ITV and CH4), DVD Player, Patio Doors to front balcony. The master bedroom has a double bed and ensuite bathroom. The 2nd bedroom has twin Beds. Both have fitted wardrobes and bedside tables. ceiling fans. One ensuite and one general bathroom. Lovely Sunny aspect overlooking the pool, Patio Table, 6 Chairs and sunbeds. Back Terrrace: Table and 4 chairs, views over Los Cristianos to the sea. 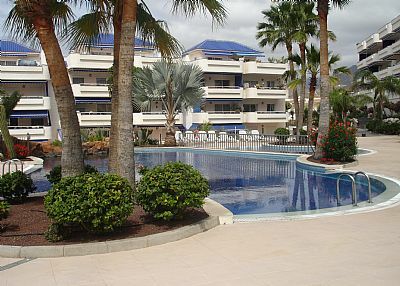 20 minutes from Airport, 5 minutes walk to Los Cristianos beach. Las Americas and Adeje Golf courses within 5-10 minute drive. This apartment is looked after by a local Management company whos details will be left in the apartment for you. They are local and available should you need them during your stay. BOOK BOOK BOOK.Fantastic apartment. I felt at home the moment I walked in. The terrace facing the pool was used all the time as you get the sun most of the day. A barbecue would have been great though. I found the double bed very comfortable and was able to sleep all night which I haven’t done in a long long time. My son however struggled as he could feel the bumps in the single mattress. I do feel people’s old food should be removed and half bottles of water not to be in the fridge. Stayed for 2 wks but bed lining was not changed once. Just want to point this out just in case your paying someone for not doing their job. I would most certainly book again. Thanks to Ray also who was a fantastic help when needed. Thank you for the lovely review. Hope to see you again in the future. Great location, facilities and fab holiday. Loved it! Thanks Ray for the support during the stay. Thank you for the 5 star review. Hope to see you again soon. Fabulous property in a lovely quiet residential complex, yet only a ten minute walk to some great restaurants, bars and supermarkets. Tha apartment had everything you could want or need, however when we arrived it hadn't been cleaned, the beds weren't made up, wet towels in the washing machine and food in the fridge. Ray who gave us the keys was brilliant, friendly and helpful, he rang the cleaner and she said she would come straight there, this was at 3.00pm, at 8.00pm I rang her and was told she wasn't expecting us until the following day, which I had read in another review. She did come at 8.30 pm and we made the beds up together, and she told us where to find sheets, towels ect as that was all I wanted to know as the apartment had lots of the owners personnel belongings around and we didn't want to intrude on their privacy. We gave the apartment a good clean the following day. The living quarters and kitchen are great however the bathrooms are very old and dated with only a small boiler not enough hot water for two showers unless you waited a while. We had to buy 10 light bulbs as they were missing or not working. I Believe this apartment is up for sale so can sort of understand the owners not wanting to spend money on the place, however do not let this put you off booking this apartment. The area is very banky so you need to be relatively fit unless you hire a car. If this apartment was in our budget we would buy it tomorrow and totally renovate it. Had a fabulous holiday and will definitely return. Thank you for the review. Really sorry that the apartment wasn't prepared properly for you on arrival. We forwarded your email to the clenaers and unfortunately you had put the wrong arrival date, hence the problem. I am sorry we didn't pick up on it. Not sure where you got that the apartment is for sale - it isn't! I am very glad you had a lovely holiday and would want to return. Thank you for the lovely 5 star review. We do try hard to give our clients the best experience possible in the apartment. Hope we can welcome you back again. From walking through the door to leaving, I could not fault this property, it was everything we wanted. We spent most of our time on the balcony when we were at home, it is huge. The only downside was the walk back up the hill after been to the beach but there was always taxis which were really cheap if you find the hill too much. Thank you for the 5 star review. As you can see we do take on board comments from previous customers to try to make everyone's experience in the apartment as positive as possible. In terms of the walk from the beach, as you can see from the photos it's pretty difficult to get an apartment much closer. And for Los Cristianos the short walk from the beach to the apartment is pretty flat. Thank you again and hope to be of assistance in the future. Lovely apartment, close to local bars and restaurants. Pool area spotless and no problem getting sunbeds. Apartment well equipped however ensuite bathroom in need of upgrade - mould in shower area and tiles badly stained. Some towels very threadbare. No change of towels or bed linen during stay as cleaner had to return to UK. Despite this I would recommend apartment as it is in such a lovely complex and excellent location. Thank you for the 4 star review and I am glad you would recommend the apartment - thank you. I appreciate your feedback and as always will act on it. We have given the ensuite bathroom a strong clean and it's come up very nice, so definitely no need for an upgrade. There were a couple of towels that needed replacing and this has now been done. As explained the cleaner was on her only holiday of the year so unable to change the linen but hopefully you were able to use the washing machine and linen provided. Hope we can welcome you back soon. One of the single beds has a pull out bed underneath for a 5th person.